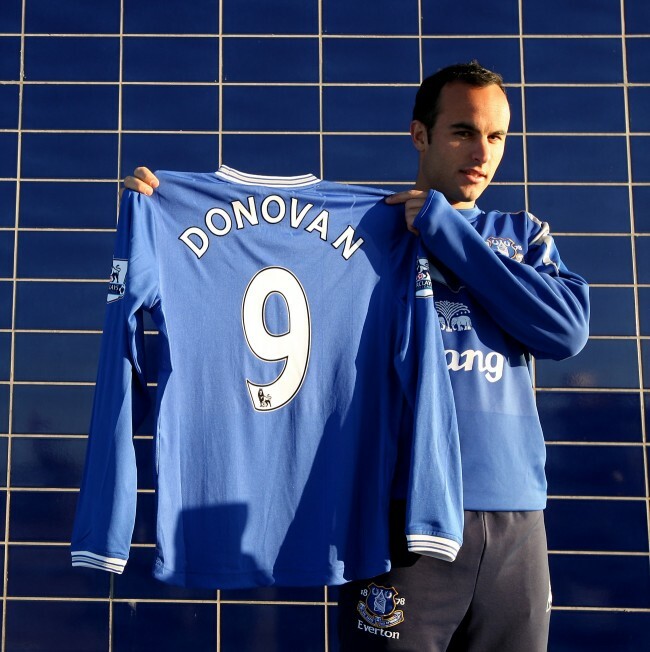 7 January: Landon Donovan is unveiled as an Everton player at the club’s training complex. The American enjoyed a fruitful spell in the Premier League and may yet return this January. 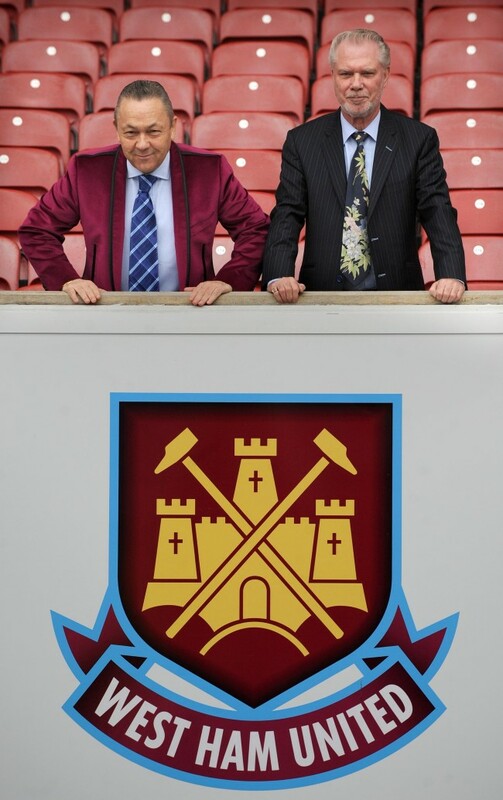 19 January: The two Davids, Sullivan (left – nice jacket fella) and Gold, pose for photographers following a press conference at Upton Park to announce their takeover of the club. 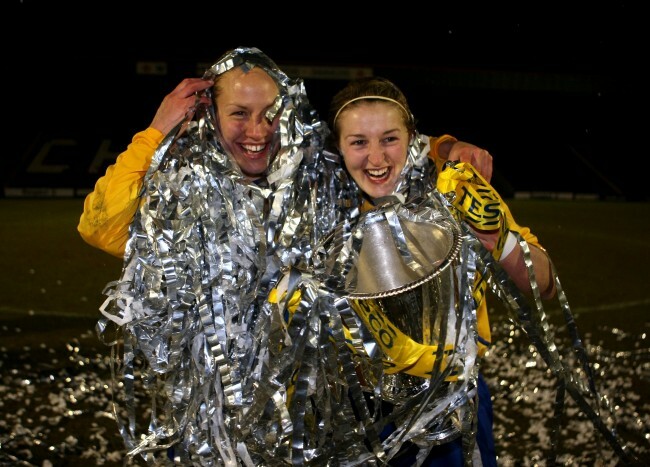 11 February: Leeds Carnegie goalscorers Katie Holtham (left) and Ellen White celebrate with the FA Women’s Premier League Cup after beating Everton 3-1 in the final, held at Rochdale’s Spotland stadium. 20 February: Swansea City’s Shefki Kuqi celebrates in trademark style after scoring against Derby County at Pride Park. 20 February: Derby County skipper Robbie Savage is hacked down by Swansea City’s Gorka Pintado. Yes, we love this picture too. Sorry Rob. 23 February: Yeovil’s Sam Williams clears the ball under pressure from Walsall’s Clayton McDonald in freezing conditions at the Bescot Stadium. It’s not a particularly telling photo, but I love the composition. 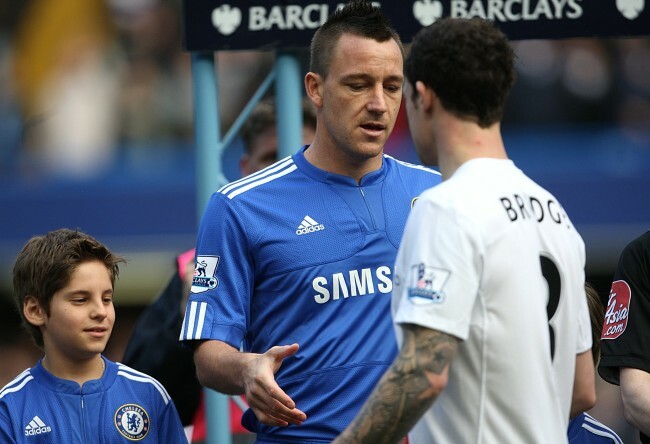 27 February: Chelsea’s John Terry attempts to shake hands with Manchester City’s Wayne Bridge, but the offer is rejected. The tabloids made much of Terry’s alleged dalliance with Bridge’s ex-WAG, Vanessa Perroncel. Were you Team Terry or Team Bridge? 27 February: Stoke City’s Ryan Shawcross walks off the pitch distraught after being shown a red card for a badly timed challenge on Aaron Ramsey, which broke the young Arsenal midfielder’s leg. Ramsey has only just returned to action. 16 March: Inter’s Javier Zanetti and Esteban Cambiasso (top) celebrate after knocking Chelsea out of the Champions League at Stamford Bridge. Shamefully, both players missed out on a place in Argentina’s 2010 World Cup squad. Nice one, Diego. 27 March: Hull City’s Jimmy Bullard (left) celebrates after scoring his side’s first goal against former club Fulham. Bullard’s efforts weren’t enough to save Phil Brown’s Tigers from relegation. 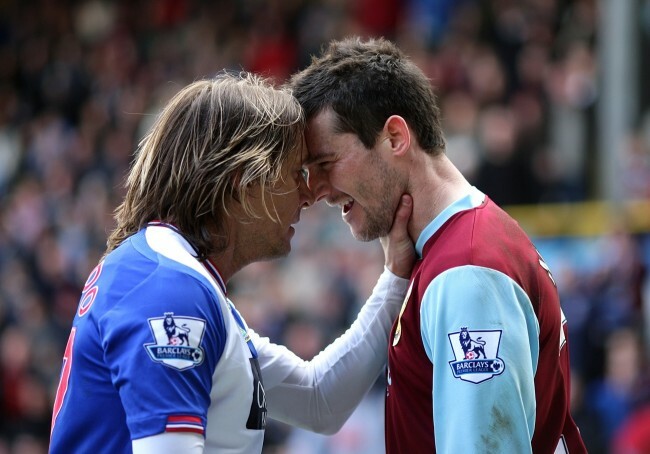 28 March: Blackburn Rovers full-back Michel Salgado (left) and Burnley’s David Nugent go head to head. A beautiful moment. 28 March: A female Blackburn Rovers fan shows her support in the Lancashire derby against Burnley at Turf Moor. And no, 1875 isn’t the number of blokes she’s slept with. 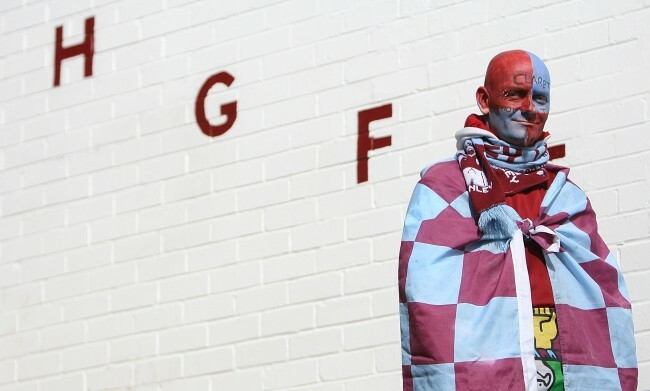 28 March: A Burnley fan outside a sunny Turf Moor ahead of the Lancashire derby against Blackburn. Rovers won 1-0. 30 March: Manchester United striker Wayne Rooney lies on the floor after injuring his ankle against Bayern Munich in the Champions League. Wazza didn’t fully recover in time for the World Cup in South Africa, leading to much frustration all round. 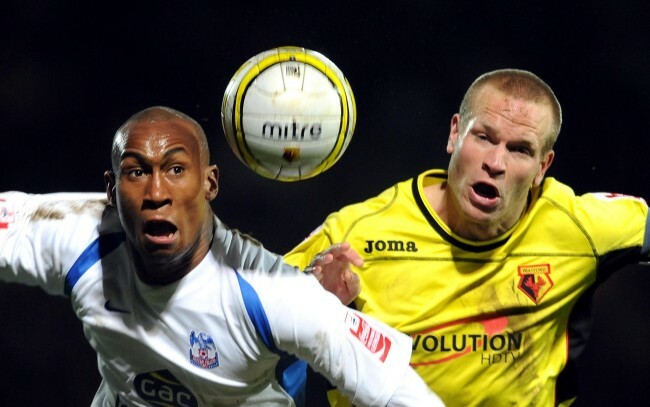 30 March: Crystal Palace’s Calvin Andrew and Watford’s Jay DeMerit (right) compete for a header during their Championship match at Vicarage Road. This pic sums up well the levels of blood and sweat you need to succeed in English football. 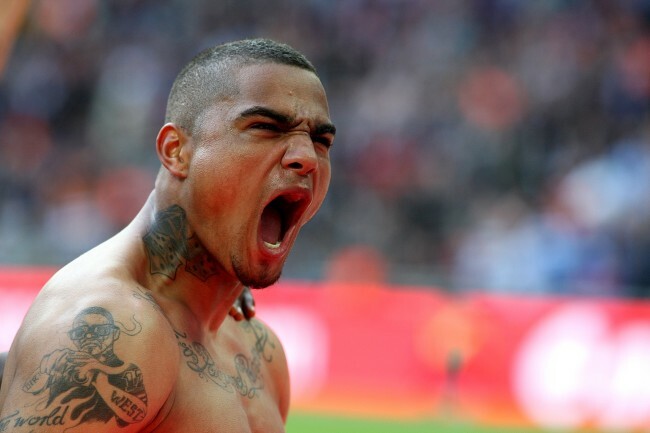 11 April: Portsmouth’s Kevin-Prince Boateng celebrates after scoring their second goal from the penalty spot in the FA Cup semi final against Tottenham. Pompey shocked Spurs to reach the final, where they lost to Chelsea. 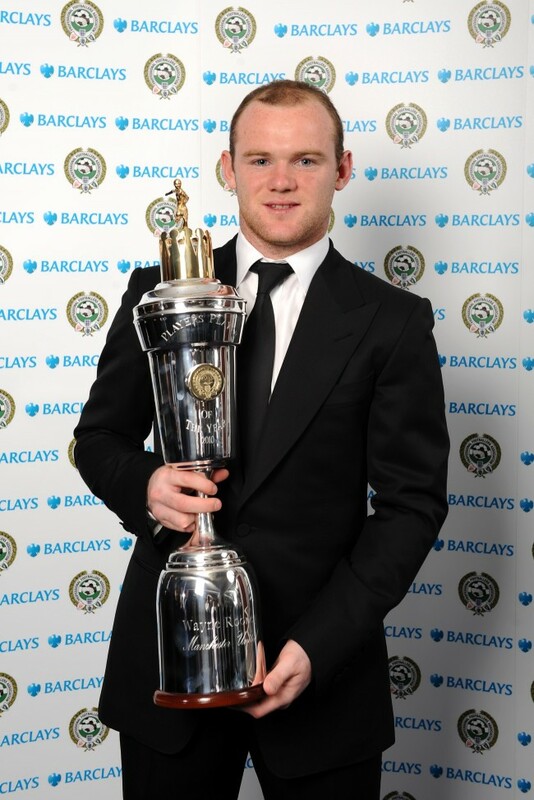 25 April: Wayne Rooney, who scored 34 goals in the 2009-10 season, poses with the PFA Player of the Year trophy. 29 April: Atletico Madrid striker Diego Forlan celebrates scoring his side’s first goal against Liverpool in the Europa League semi final second leg. Atletico reached the final, where they beat another English club in the form of Roy Hodgson’s Fulham. 16 May: Wahay Lampsy! 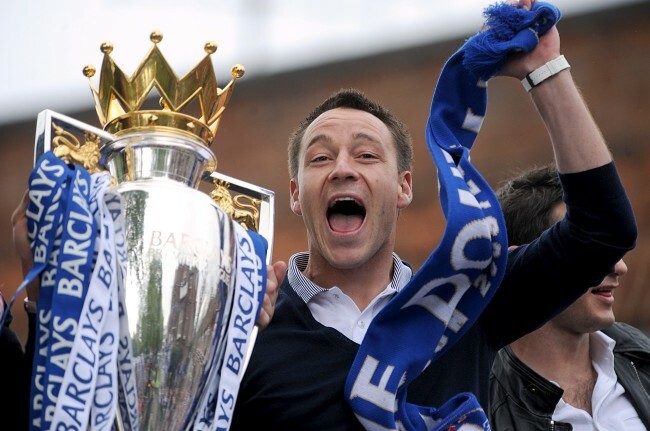 Chelsea captain John Terry celebrates winning the Premier League and FA Cup double atop a double decker bus trundling through west London. 22 May: Inter striker Diego Milito celebrates after scoring his side’s first goal against Bayern Munich in the Champions League final. Milito scored a second goal to seal victory for the Serie A side. 29 May: Millwall players break out the bubbly after gaining promotion to the Championship with a victory against Swindon Town at Wembley. 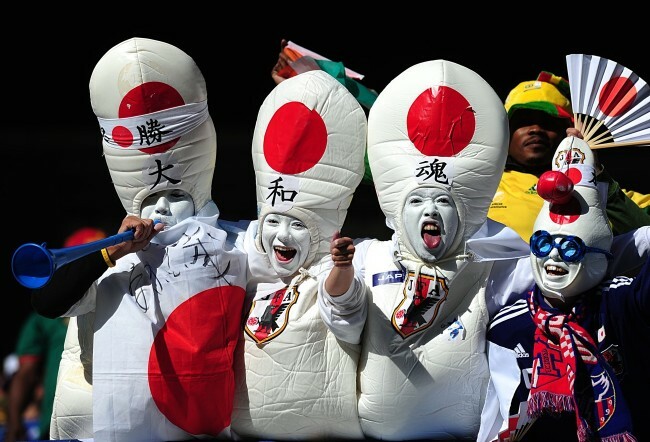 14 June: Japan fans liven up their team’s World Cup group match against Cameroon. The colourful fans were one of the best things about a largely disappointing tournament. 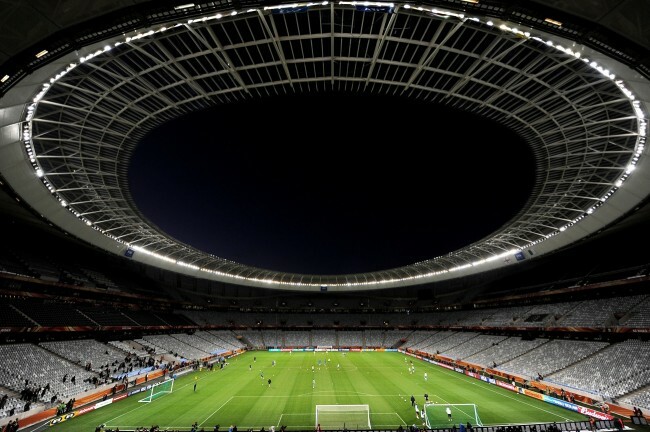 17 June: A view of the interior of Cape Town’s majestic Green Point stadium as England train at the World Cup ahead of their group match against Algeria. Shame that such a brilliant stadium was graced by such a terrible match. 24 June: That’s a card ref? 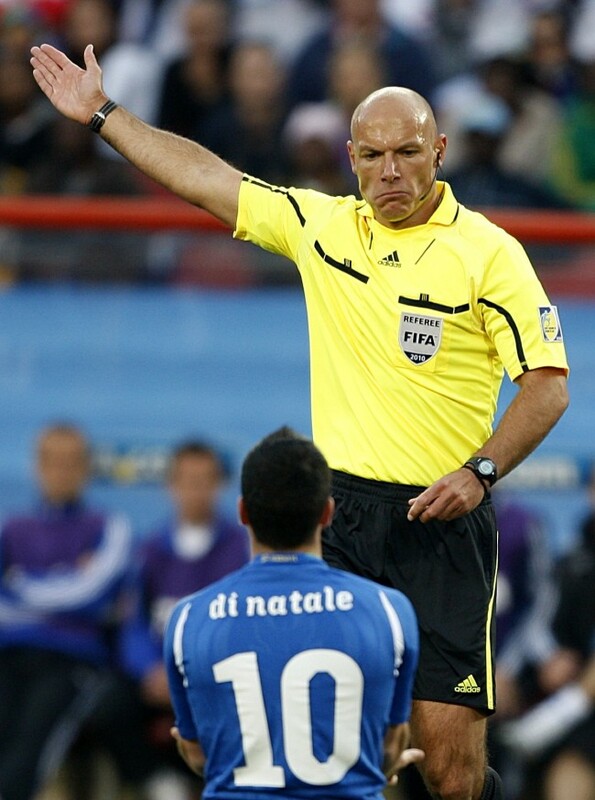 Italy’s Antonio Di Natale looks up at referee Howard Webb during Italy’s World Cup group match against Slovakia. 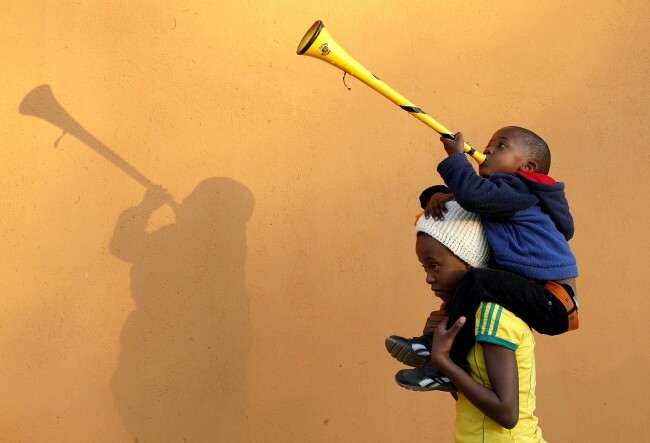 24 June: Local boy Bathandwa Sifumba, 11, and an unknown boy on his shoulders playing a dreaded vuvuzela, pose for a photograph outside the Royal Bafokeng Stadium in South Africa. Nice one,cant wait til tommorow. very interesting pictures! love the shot of rooney injured!